The name of the band reminds us of the classic Gladiator film where Russell Crowe aka “Maximus” was nothing short of a complete madman who would die for his family and country without fear or worry of what might happen to him in the process. 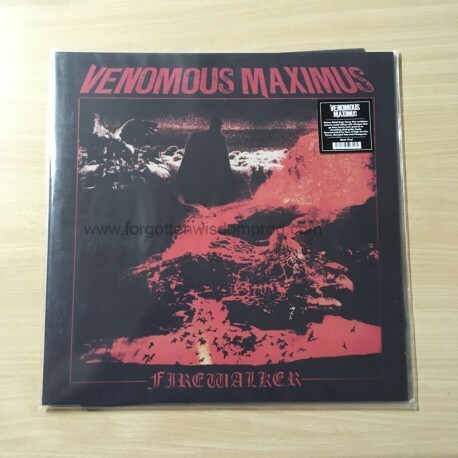 VENOMOUS MAXIMUS is very much like that with their approach to their attitude and will to play music with conviction without any genre barriers or any worries if they’re being “true” to the elite or cult fans that quickly dismiss anything after hearing 10 seconds of it. What we have here is a band that is interested in writing, not just good songs, but GREAT memorable songs that vary in length, tempo, and emotion. Those whom are familiar with the first album they put out with Napalm Records in 2012, “Beg Upon the Light” know what kind of a treat you’re in for. Their 2nd and new album “Firewalker” is a great continuation of their talents. It’s really rare to find bands that have no barriers and just focus on quality songs. This really takes us back to the beginning of Heavy Metal when Black Sabbath would just put out records. Some of the jams would be fast and heavy, while others would be slow and powerful. Black Sabbath could play any genre because they invented all of the heavy metal genres you hear today and when you hear VENOMOUS MAXIMUS it takes us back and reminds us that you don’t have to think about what kind of music you’re listening to. It’s just GREAT music and you love hearing it. Gregg Higgins heads this band with his very powerful and commanding vocals and chants that immediately raise fists in the air. There’s an obscure Psych / Rock band (also) in Texas from the 70’s/80’s called “Roky Erickson” and if you YouTube “Night of the Vampire” or “Stand for the Fire Demon”, Roky’s vocals remind us of Gregg’s vocals in a way that are so captivating, they literally force you into their world, and you can get lost in the music. With the rest of the band being tighter than 2 coats of paint, this band can do it all and do it all extremely well. They can easily become as big as and share fans with bands like GRAND MAGUS, HIGH ON FIRE, MASTODON, while not sounding like any of those bands and paving their own “path of doom”.